When I was in High School, getting a hall pass was like a gift from above. You could roam the halls, do anything you wanted and you felt like a king for a brief moment. If someone of authority came up to you questioning what you were up to, you just flashed your golden ticket and you were free. So, imagine you’re married and your wife decides to give you a hall pass. One week off from marriage. You’re free to do anything you want! That’s the premise for the Farrelly Brothers new movie, Hall Pass. 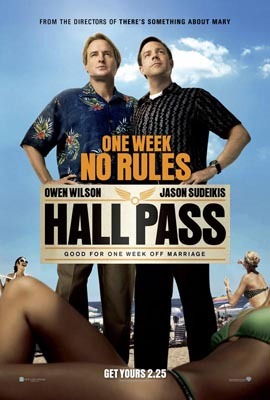 Starring Owen Wilson, Jason Sudeikis, Jenna Fischer, Christina Applegate, Stephen Merchant and the great Richard Jenkins, the movie is at times incredibly hilarious and unfortunately, incredibly slow. The funny parts, I won’t go into *cough* masturbating in cars, naked guys in jacuzzi’s *cough* so please don’t even ask me because I won’t tell you. The only problem I had with the movie were the scenes with the wives. Jenna Fischer and Christina Applegate are two great comedic actresses but they were wasted here. Most of their scenes are slow and grind the film to a halt. After they give the guys their hall pass, they realize they have one as well. Their story is almost from another movie and I wish it weren’t the case. But, don’t let that stop you from seeing the film. Sudeikis and Wilson bring it and bring it hard. And they easily get an assist with Stephen Merchant, J.B. Smooth and Larry Joe Campbell as their ‘wing-men.’ Add in Richard Jenkins as their booty-guru and you can’t miss. And if you really want to laugh, do not miss the end credits. Stephen Merchant has about 3 minutes of screen time you wont want to miss. At some point, someone is going to have to give him his own movie.